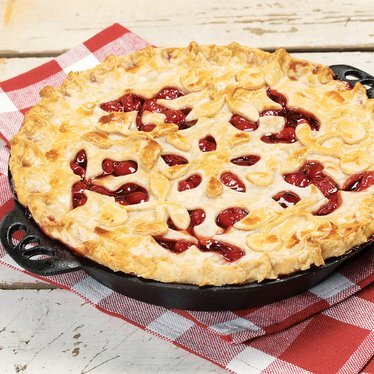 Your hard work will be appreciated with this cast iron pie pan. Homemade pies and casseroles get the respect they deserve with a pan that helps them turn out their very best. 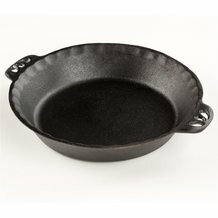 Cast iron heats evenly, so your crust gets perfectly golden brown all the way around - no soggy crust. And with the pre-seasoned finish, removal of food is easy. The more the pan is used, the better the non-stick surface gets. Made by Camp Chef. After cleaning, warm the pan in the oven to remove any moisture. We recommend applying cast iron conditioner before storing. This will help maintain the pan's non-stick surface. I own a very expensive pie pan from a well known manufacturer. When I use it I have to grease it first! I purchased this product as a replacement and can not say enough about how much I like it. Perfect crust. I'm planning a few as gifts for family. This is my second cast iron pie pan that I've purchased from Lehman's. I loved the first one so much, I had to purchase another! The crust comes out so flaky and the pie comes out of the pan super easy. I did notice when making an apple pie, if we didn't eat it fast enough and some of the apple juices ran underneath the crust, the crust would have dark (almost black) marks on the bottom of the crust. Those parts did have a bit of a metallic iron taste to it. It was a chemical reaction between the apple juice and the iron. I get a chemical reaction when I cook tomato products in my dutch oven or skillet, so this really wasn't a concern to me. I've also had many compliments of how "pretty" the pie pan is. The only con I have about it is, it's made in China and not the USA. I was raised with cast iron; it's all I've ever used. I'm always on the lookout for a piece I don't have to enlarge my collection and the pie pan is the latest addition. I cannot rave enough! Crusts are flakier, the center is not soggy. Can't wait to make pot pies! Finally! This is the only pie plate I'll ever need! I''ve been baking pies for years, and have several of the expensive dishes. Problem has been how to get bottom crust to be dry enough that fruity fillings don't leak through. Had tried pre-baking crust; no good. This one is PERFECT! No need to use Crisco, spray oils or ANYTHING. Just crimp your crust and pour your goodies in there. Haven't done lattice or open top yet, but I'm sure they'll be perfect. It's so deep that I'll probably need to use as many as 8 cups of fruit to get a nicely crowned pie---but that's OK. Give your other pie plates away; this is the one you'll be buried/cremated with (yes, I know the pan won't melt. Some will try to "pry it from your cold, dead fingers.") Spread the joy. I purchased this pie pan for my son who loves baking every kind of pie imaginable. He's gotten quite good at it and claims his pies could not be any better. I thought I'd put that claim to the test by providing him this pan and asking if his results in pie baking were improved. They were. The crust is flakier and the fillings remain delicious. He couldn't be more pleased and I am looking forward to enjoying all of those pies he will be making even more often. Quite a nice find ! Generally I purchase Lodge cast iron products, but I decided to give this pie pan a try. I LOVE IT! Even though it did come pre-seasoned, I did season it the way I season all of my cast iron. The first thing I noticed was I could almost slide the whole pie right out of the pie pan, had I tried. The very first piece came out easily and all intact. Then I asked my husband if he noticed any difference in the crust. His comment was "airy". I asked if he meant flaky and he said most definitely. I am in the process of ordering another pie plate as I write my review. I'm not real keen about purchasing items from China, but I liked it enough that I'm taking the plunge again. It's also a very nice looking pie pan. I would highly recommend this to anyone. It's not Lodge quality but it is a very good cast iron pie plate. We seasoned it to bring it to our standard. Pie just falls out of it. How does pie making get any better than that? I am going to order another one to get ready for the holiday season. My daughter & her family gave this to me as a gift a few years ago. I love making pies & quiche in it. The crust is so flaky & comes right out!